The Apple Watch's arrival in stores Friday failed to draw the same crowds that greeted the launch of the iPhone 6—but this may be a sign that Apple fans are prepared to queue overnight to buy, but not just to try. Online, the smartwatch is already sold out until June. For the next two weeks, visitors to the stores can only look at the watches or—by appointment—try them on for 15 minutes. They can also preorder the watch, which won’t go on sale until April 24, but since this is done via Apple’s online store, they could just as easily order at home, or through Apple’s mobile app. 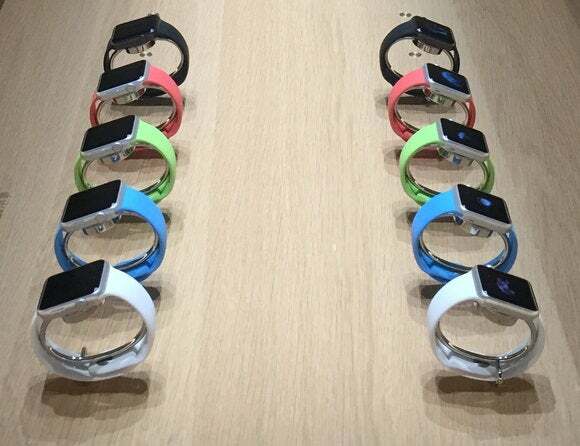 It’s little wonder that Apple is encouraging people to buy online rather than hold inventory in store: With three models of Watch, each available in two sizes and two colors, and a variety of bracelet options, the company has created a stock-keeping nightmare for itself. It shows 38 models of the watch on its website, though even that doesn’t take into account all possible variations of case and strap color. First in line was William Prütz, 20, from Sweden, who has spent the last five months in Australia. He is already a fan of watches, and sported a US$1,000 Certina, a Swiss brand, on his left wrist. Acquiring an Apple Watch could pose a dilemma for him: “I don’t want to replace this one,” he said. Prütz already has the iPhone needed to make calls via the Watch, which doesn’t have a cellular connection. He is most interested in the health-related applications, as he’s a cyclist and does other training. Fitness applications for the Watch also appeal to Sandeep, a 38-year-old IT security specialist, who didn’t want to give his last name. He already has three watches, which he uses for various occasions. On Friday, he wore one made by Kenneth Cole with a silver metal band. He said he’s been a fan of watches since he was six or seven years old, when his parents bought him one as a gift. He was crushed when he lost it. If he buys the Watch, it will be the basic model, as for him it’s “more about the technology” rather than fashion: all of Apple’s Watches contain the same electronics, regardless of finish or band style. 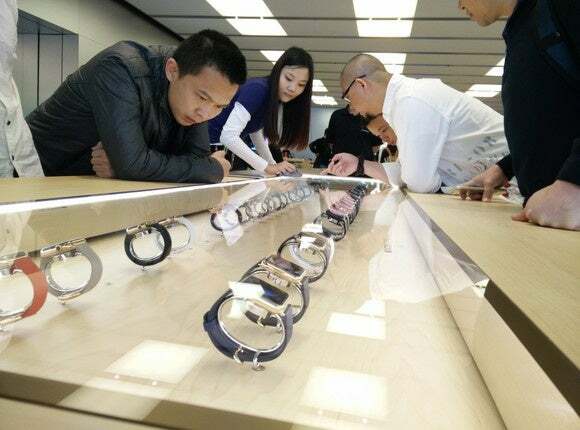 Xie, a venture capitalist, has been investing in smart hardware, and wanted to know more about Apple’s latest product. “A lot of other smartwatches use Android, but I want to pick Apple because of its App store,” he said. At the company’s Omotesando store in Tokyo, about 40 people were lined up to see and order the watch just after 9 a.m. Friday—a far cry from the 200 that waited there to buy an iPhone 6 at its launch last September. The large store had been remodeled to highlight the watch, with SoftBank’s Pepper robot, a prominent display until Friday, relegated to the downstairs level. Nobody paid any attention to the white humanoid as it gesticulated and spoke to no one in particular. A SoftBank shop attendant helps Tomoki Hasegawa, 38, choose an Apple Watch on Friday in Tokyo. The smartphone app developer said the smartwatch reminded him of cool wrist gadgets used by superheroes on TV shows he watched as a kid. Hasegawa said he doesn’t know what the smartwatch does in detail, but was excited to have ordered one. He expects to receive it sometime after April 24. “The Apple Watch seems like it works much better than my Sony SmartWatch 2, which is sluggish,” he said. The Sport edition also wowed technology writer Makoto Saito, 23. She thinks the smartwatch will be useful on crowded trains where there’s little space to use a smartphone. “I chose the 38 mm size because I’m used to the small screens on Japanese ‘garakei’ flip phones,” she said. 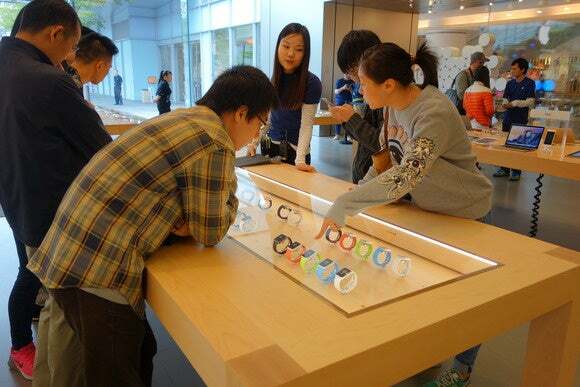 Aside from SoftBank, the Watch was available at Apple Stores in Tokyo. 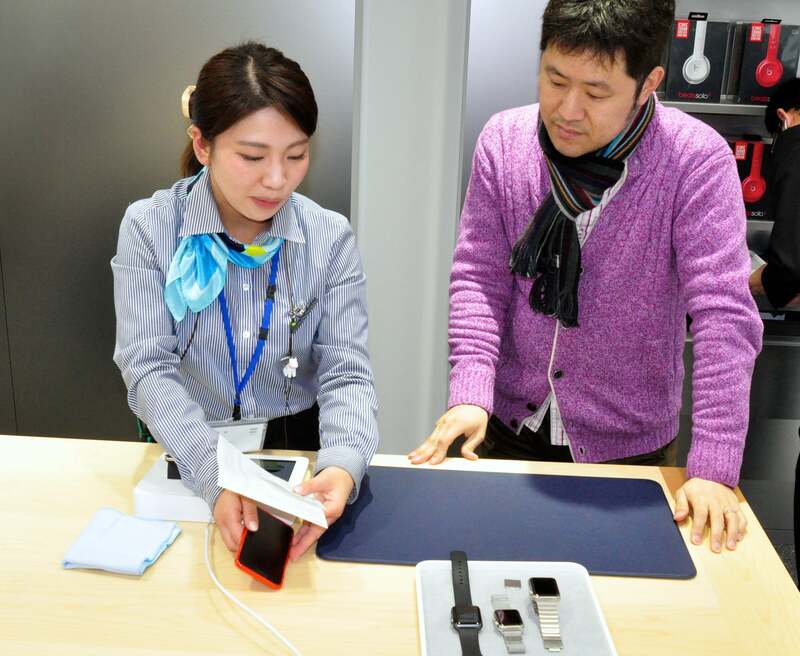 Japan’s two other mobile carriers offering iPhone, NTT DoCoMo and KDDI, are taking a wait-and-see approach to the timepiece. DoCoMo hasn’t decided whether it will carry it, a spokesman said, while a spokesman for KDDI could not comment on the company’s plans.